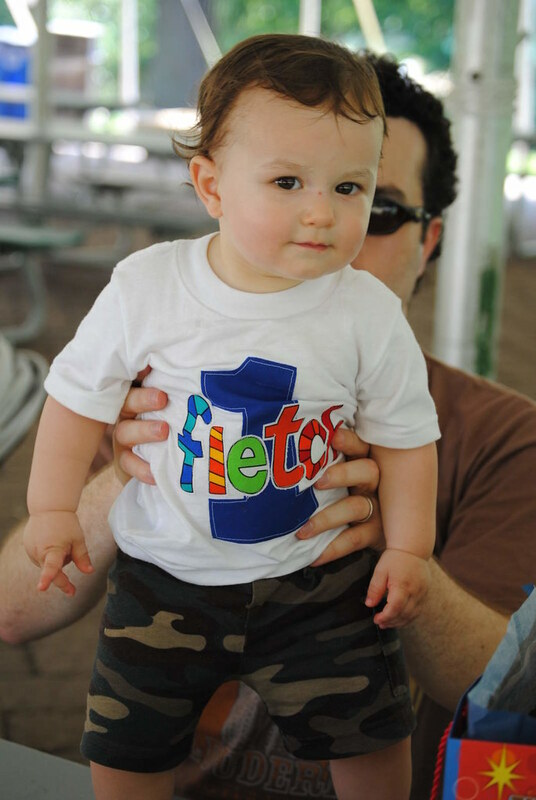 For Fletch's 1st birthday, we had a small party at the National Zoo on Sunday. His birthday was actually on Monday, but who is going to show up to a birthday party on a Monday? 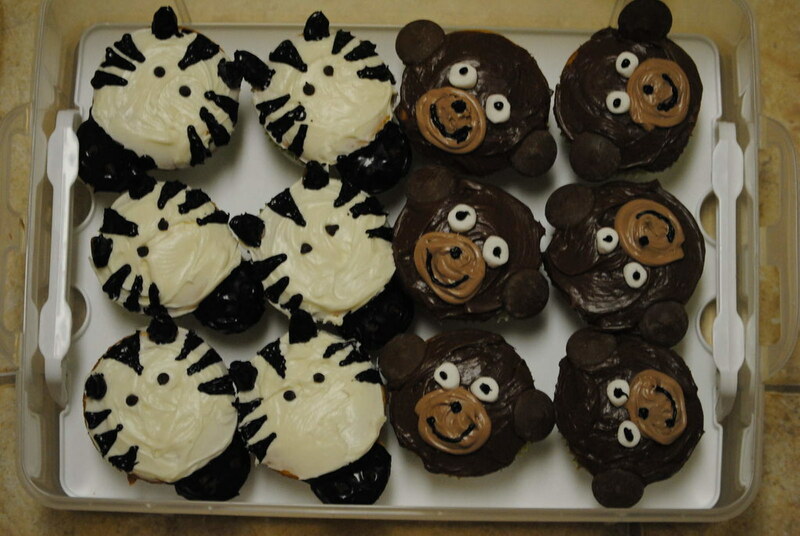 Since his birthday was at the zoo, I made some zoo themed cupcakes: Lions, Tigers, Zebras and Monkeys. We got to the zoo right when it opened so we could try and score a picnic table for us to set up camp. We lucked out and found a giant white tent with tons of picnic tables available. It was right across from the Orangoutangs and we even got to see them do their rope walk right over our heads. We all hung out and snacked on cupcakes and guzzled water. It was incredibly hot for June, but being under the tent helped tremendously. Fletch got to taste his first cupcake at his party. 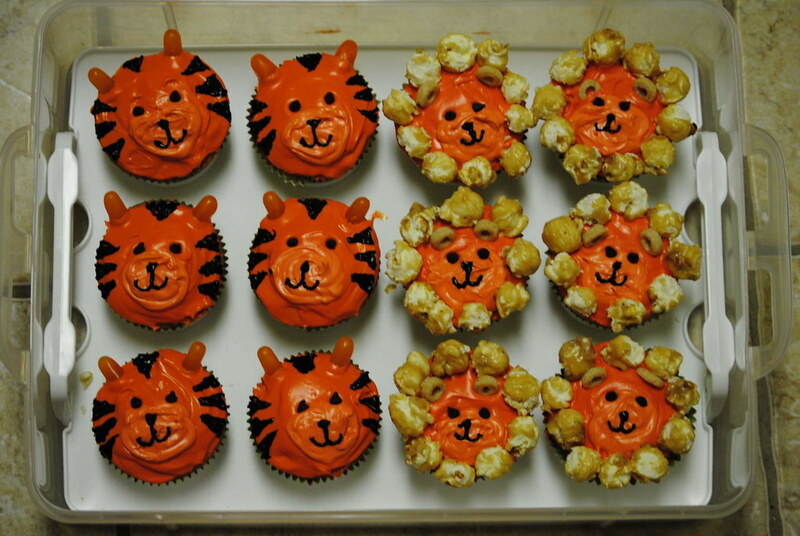 I shared a lion cupcake with him. Cupcake Demolition from Jennifer Shock on Vimeo. Today is your first birthday. You've come a long way baby. Before you were born, I had no idea what was in store for us. I knew we wanted a baby, but wasn't quite sure what to expect. We were warned our lives would be completely different. Some people said to enjoy ourselves before you arrived, because once you were here we would never enjoy ourselves again. Some people told us how hard it would be: sleepless nights, 3am feedings and non-stop crying. Everyone seemed to have some form of warning for our impending parenthood. They were pretty much right. We haven't gone out very often since you were born and you did give us quite a few sleepless nights. However, what you have given us in return is so much more rewarding than a night out or a full night's rest. Your father can attest that I am not a morning person. However early you may wake me up, as soon as I walk in the room and see you smiling at me I am glad to be awake. Those dimples of yours are a constant reminder that you are definitely my son. Right now you only have two bottom teeth, but you love to show them off. Sometimes you even give me a big hug and a kiss. Those are the days that I will cherish when you are a teenager and refuse to give me even a nod, much less a hug or a kiss. When they laid you on my chest right after you were born, my first instinct wasn't to cry tears of joy. It was more like, "Holy cow there is a wet, squirmy baby on my chest!" Everything I read in all the baby books was magically erased and I was working on pure motherly instinct. It took you a few weeks to get the hang of breastfeeding, but once you learned you were a champion! Since then you have mastered the bottle, sippy cup, straw and solid foods. You are an eating machine. You haven't met a food you don't like and I want to thank you for not being a picky eater. That may change in a few years, so I'm going to enjoy your zest for variety while I can. You were an average sized baby when you were born, but no one seems to believe me when I say that. You are constantly mistaken for being older than you really are. You've been called a moose, a linebacker, fat (thanks Aunt Penny) and "healthy." You've always been in the high percentile for length, but never for weight. So don't let anyone make you out to be some huge mutant baby. You are perfect in every way. When I was young and stayed out late, my mother would tell me that one day I would understand how it feels to worry about your child. (Mom, you were totally right.) I worry about you staying healthy. I worry about you growing up in the crazy world. Sometimes I worry about you getting into a car accident when you are a teenager, and you're only one! You are so precious to me and I will do everything in my power to make sure you grow up safe, happy and healthy. And I also promise to take care of myself and your father so that we are around for you as long as possible and God willing. You are an amazing boy. You are constantly growing and changing. Your father and I love watching you learn new things. It makes us feel like we are doing something right. In fact, just having you around makes us feel like that. You are a blessing in every way possible. I love you so very much, sometimes I feel like my heart could explode. I hope you grow up knowing and feeling all of the love that we have for you. Happy Birthday Fletch from Jennifer Shock on Vimeo. Fletch has been standing up for quite some time and we were patiently waiting to see when he wanted to take some steps on his own. I saw him out of the corner of my eye one morning trying to walk from his music table to the toy box, but he didn't quite make it. I decided to get in the pen and try to motivate a few steps out of him. I used a book, because he has become quite fond of books. They are the first thing he takes out of the toy box in the morning. He finds a book, sits down and starts to babble like he is actually reading the book. It is very cute to hear him attempt to read. He actually has some inflection in his voice, so I think he's grasping the English language. Back to walking...I got in the pen with him and used a book to try and get him to walk towards me. It actually worked! He took some tiny steps toward me. He is no Fred Astaire yet, but he will have us chasing after him in no time. He still amazes us every day. It's hard to believe it has almost been a year since he was born. We are excited to see what the next year has in store. My family made my first Father's Day fun and memorable. 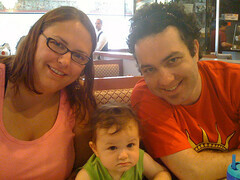 We took a road trip to visit my sister Lisa (Aunt LiLi to Fletch) and bro-in-law Steven in New York City. We visited the Statue of Liberty, took a tour of NBC Studios at 30 Rock (we got to sit in the SNL studio!) and went to the Mermaid Parade freak show at Coney Island. We of course had lunch at Nathan's. We also had lunch at Grimaldi's under the Brooklyn Bridge. We went to brunch on Father's Day. I recommend the pastrami omelet. Check out all the pics.